Posted in Soups, on August 19th, 2013. With a huge cauliflower in the refrigerator, I’d planned making the Cauliflower Soup with Olive Oil Drizzle, a cold soup that we devoured just a few weeks ago. It was SO good. But then I ran across another cold soup recipe . . . well, you know how that goes . . . I did make a few minor detours: (1) I did not sieve the soup to remove all of the cauliflower and apple pulp (I just didn’t know why I should do that since the solids are good for us); (2) instead of milk, I added half and half because I had it in my frig and needed to use it up; and (3) I served it warm (only out of expediency as it didn’t have time to chill – but we ate it cold the next night and it was just as good if not better). The soup is very easy to make, as long as you don’t count the step of having to puree it in the blender (it took 2 batches for me). Steaming the cauliflower took awhile as I had a lot of it and I didn’t want to cook it over too high heat, but once done, it was pretty cinchy easy to puree it. I added the half and half in the blender, along with the yogurt. I was lazy and didn’t toast the almonds. What’s GOOD: the altogether flavor of the cauliflower and apple, and the curry. The crunch of the almonds on top. It was just wonderful. What’s NOT: zero – it was really good. A keeper. Recipe By: Adapted from Williams-Sonoma Cooking for Friends, by Alison Attenborough and Jamie Kimm (Oxmoor House, 2008). 2. Meanwhile, prepare a large bowl of ice water. Transfer half of the soup to a blender, add half of the yogurt and blend until smooth. (If desired do the following step:) Pour the soup through a fine-mesh sieve into a bowl. Puree the remaining soup and yogurt and pour through the sieve into the bowl. Nestle the bowl of soup in the ice water, stirring occasionally, until cool. Once cool, cover and refrigerate until ready to serve. 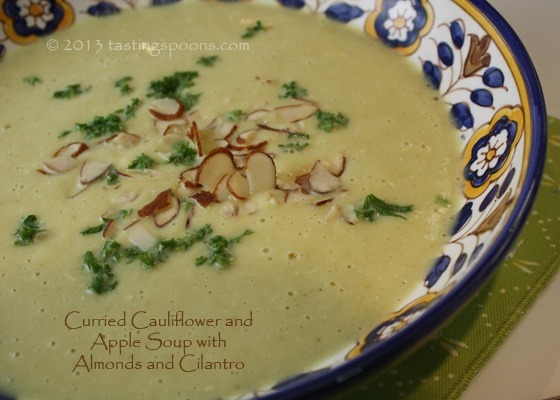 To serve, ladle the soup into chilled cups and garnish with the almonds and cilantro. Per Serving: 242 Calories; 14g Fat (49.9% calories from fat); 9g Protein; 23g Carbohydrate; 4g Dietary Fiber; 12mg Cholesterol; 855mg Sodium. I just happen to have a caulifower here, so that will be tomorrow’s lunch I think. Thank you!